I don't understand Will Ferrell. I cringe at the sight of his hairy chest. I roll my eyes at such self-absorbed lines as "I'm kind of a big deal ... people know me." And I'm over the plot of a middle-aged doughboy starring as a famous and desirable anchorman/race car driver/ice skater/basketball player. But who's to say whether something is funny or not? Comedy in general all boils down to taste. On one side, there are the Will Ferrells who will yell, fart and fight for laughs, and then there's McSweeney's. The San Francisco-based magazine, book publisher and Web site has become a pop-culture hub for quirky wit and unexpected satire that doesn't quite fit in anywhere else. McSweeney's has published works from offbeat writers such as (editor and founder) Dave Eggers, George Saunders, Neil Gaiman and Michael Chabon. The latest collection, which was recently released on April Fool's Day (no kidding), is The McSweeney's Joke Book of Book Jokes, a snarky set of book-related letters, lists and spoofs from its Web site. 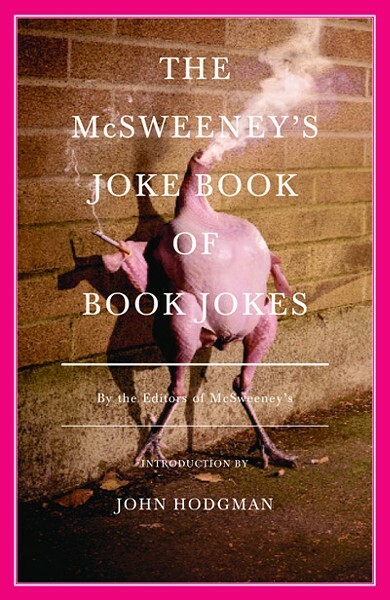 In his introduction to Book Jokes, John Hodgman (author, humorist and the PC personification in the Mac commercials) calls McSweeney's' works "relentlessly smart and inventive, often unbearably funny, and largely preoccupied with the fact that, other than allowing us to make fun of them, our English degrees were pretty useless." But they'll also come in handy for Book Jokes, which includes essays such as "Feedback from James Joyce's Submission of Ulysses to His Creative-Writing Workshop," "Holden Caulfield Gives the Commencement Speech to a High School," "Winnie-the-Pooh Is My Coworker," and "Ikea Product or Lord of the Rings Character?" No one's safe when it comes to poking fun at style, grammar or content. The McSweeney's editors and contributors have no qualms about tackling canonical authors. Matthew Collison and Chris McCoy play on Hemingway's curt sentences, repetition of random details and obsession with alcohol and wars in their essay "A Selection from the Posthumously Published Ernest Hemingway Choose-Your-Own-Adventure, A Very Short Death, c. 1959." Sean Carman lampoons Homer's The Odyssey in "From the Found Notebooks of the Members of Homer's Writing Group," and Alex St. Andrews puts his own spin on Franz Kafka's Metamorphosis in "Social Security Denies Gregor Samsa's Disability Claim." Most of the essays are savvy combinations of book smarts and pop culture and, of course, some work out better than others. Sean Carman's "Jane Eyre Runs for President" sounds promising but falls flat. It's fun to imagine plain, quiet Jane running a country rather than pining for Rochester and trying to find herself. Plus, the mad woman in the attic would be an interesting skeleton in the closet for her opponent to unveil during debates. But the essay doesn't go there and Carman's protagonist could be any Victorian woman. The McSweeney's Joke Book of Book Jokes is witty, insightful and for lit nerds who prefer their humor in book form so much so that they'd rather buy a hard copy than search the McSweeney's online archives for free. Plus, it has a pink cover with a raw chicken smoking a cigarette on it. "We all know that books are funny. First, they are made of paste and cloth, which is funny, as is the fact that people still buy and read them." -- From John Hodgman's introduction to The McSweeney's Joke Book of Book Jokes.